Self Wringing Mop Made From Super Absorbent Synthetic Chamois. Many people exclusively use shammys to clean their floors due to the incredible cleaning and absorption power they provide. While it can be a quite effective method, most of us don't want to get on our hands and knees in order to wash our floors. This great tool is essentially an advanced way of putting a shammy on the end of a stick so that you can mop floors using the material, but without actually getting down on the floor. It takes the synthetic chamois material and divides it into thick strips to form a string mop-like head. This reusable head is completely detachable for washing, and is easy to use thanks to the integrated twist wringer. Simply pull up and twist to unload all of that dirty water and collected debris without getting yucky, straining your wrist, or doing it by hand. A sturdy, one piece pole completes the package, and gives you a powerful tool to clean any hard floor. 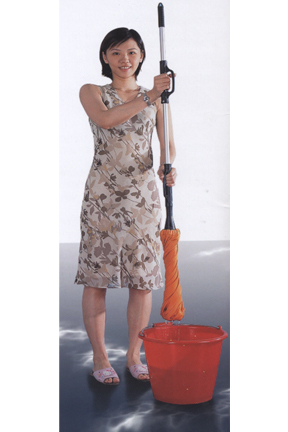 Because this mop utilizes shammy material for the cleaning head, it is unbeatable for absorption. This feature makes it perfect for soaking up spills, drying boat decks, cleaning the bathroom, and of course, any regular mopping job too. Each strip is super soft and extra thick, so it will be gentle on floor surfaces while remaining tough on dirt. You can safely use it on any hard floor without worry, and with any cleaning solution you prefer. Sweep and mop at the same time because the advanced head will pick up light debris as it wipes the surface clean. This will ensure that you are left with sparkling floors and are able to finish the job in half the time. Made from the same material as the widely popular Super Shammy, the head on this mop is unmatched for its absorption properties. It can soak up nearly 20 times its weight in liquid, and it won't drip on the way back to the bucket. The advanced material will lock in the moisture and all of the dirt so you can avoid drips as you move back and forth. It is similar to a string mop, but has fatter and thicker strips. When compared to a cotton mop it will not only hold more liquid, but it will also do a much better job cleaning as well. The soft material is safe for any flooring surface, and since it is made from shammy, it can actually pick up light debris as it wipes the floor clean at the same time. You will be able to sweep up chunks while you shine and polish the surface when cleaning floors with this tool. The head can be used over and over again, and many times a simple rinse is all that is necessary between mopping. If you want to sanitize or thoroughly clean the mop head, it is easily removed for machine washing. Replacement heads are also available, but a single one will last for many many uses before it would ever need to be replaced. Thanks to the integrated wringer this mop is incredibly easy to use. You never have to touch dirty water, and you don't need a fancy bucket either. The handle and head combine to provide an easy way to thoroughly wring out this mop. Simply pull up to make the shammy strips straight, and then twist to release the water. Because of the high quality design, it takes little effort to get out an amazing amount of liquid. Once the dirty water is let out, you simply let go of the twist wringer to allow the head to fall back to normal, and then resume mopping. This great feature will make your job go faster while it reduces stress and strain. You won't have to bend over or squeeze with your hands, and you don't even need to push around a bucket if you don't want to. Just fill up a sink and walk back and forth because the shammy material won't leave dirty drips along the way. Once you get back to the sink, twist the dirty water out, soak with fresh cleaning solution and be on your way. Using the Shammy Twist Mop is easy. When fanned out, the mop head covers a large area of floor, but since it is made from thick strips of viscose fabric instead of something more rigid, it can also become compact to fit into tight spaces too. The top, twist handle allows you to have full control over the head at all times. A quick twist will separate the strands and allow you to cover the maximum amount of floor, while simply lifting and holding it vertically will make the strands more compact. To mop your floor, simply dip it in a bucket of cleaning solution, and then pull out. Hold the mop straight up and down over the bucket with one hand on the lower handle, and your other hand on the top one. As you hold it, simply twist in opposite directions to wring out excess water with minimal effort. Once you have done this, just untwist and release the head in order to mop. To avoid the possibility of tangling, you will want to make sure the strands are all the way straight and untwisted prior to letting the head fall. When you mop, you will want to use circular, or s-like movements, and continue along in one direction. As you move across your floors, the head will continue to pick up dirt, grime and other messes until they are totally gone, and locked into the fabric. Once the head is soaked, or coated with dirt, simply bring it back to your bucket or sink to twist out the dirty water. After releasing the dirty stuff, you basically start right over and re-dip in cleaning solution, wring out excess moisture, and then continue on your way. With this mop, it is recommended that you always use some sort of floor cleaner or soap when mopping. You can use traditional floor cleaners, or you can try something a little more environmentally friendly like Quick n Brite, or vinegar and water. If you would prefer a similar mop that can clean with just water, then check out the Ultimate String Mop. It doesn't have the wringer, and can not absorb as much moisture, but the microfiber strips will allow you to cut through dirt with just water as a detergent. When compared to similar looking products, this one will be higher quality and longer lasting. Each component is made from superior materials, and built to last. Don't be fooled by TV versions, or similar units sold elsewhere. We have tested this mop against the others, and it easily outmatches them. The head will cover more area, and is made from a higher quality material which will make it work better and last longer. Instead of a multiple piece pole that fits in a teeny box, this mop comes with a sturdy, one-piece pole that is a standard, full-size length. The attachment method for the head is secure and won't break or wear out, and when you wash the head, it will hold up well, and continue to work just as efficiently. The wringer isn't flimsy, and it doesn't take extra effort to use it. If you compare this mop to other self wringing twist mops made from cotton, the competition is almost nonexistent. Cotton strings and strips can not even hold half as much liquid when compared to shammy, and they are not even in the ballpark when it comes to cleaning ability. If you are looking for a mop in this style, or you just need one that is highly absorbent, this is an excellent choice that you won't regret. 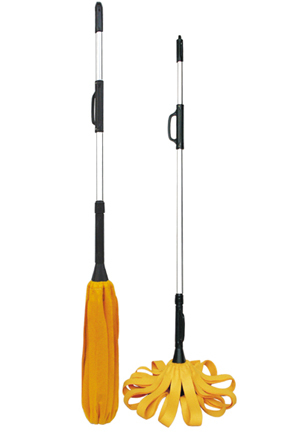 Perfect for parents, professional cleaners, boat owners, or anyone that prefers a mop and bucket style of mopping. This tool is the quickest and easiest way to clean up any spill on a floor, but also offers an efficient way to mop as well. It will soak up large amounts of moisture and allow you to move them without dripping and also offers a safe and effective way to get any hard floor clean. You can use it with harsher stuff like bleach without ruining the material, and the soft strands are guranteed to never scratch delicate flooring like hardwood and marble. The handy twist wringer will eliminate the need for bending over or wringing by hand, and does not require you to have a commercial style bucket on hand. Order Yours Today! 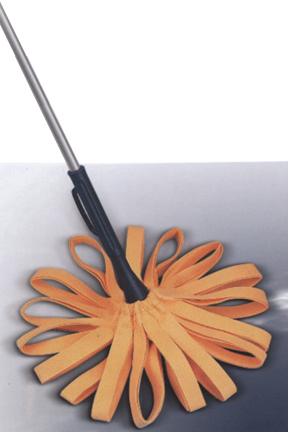 Shammy Twist Mop - A versatile mop with unmatched absorbency. Sop up loads of liquid, and safely use on any floor surface. The built in twist style wringer will eliminate bending, and prevent you from touching dirty mop water. Have used these mops since they first came out years ago. I now have 2 of them and on the waiting list for another. I have order mop head replacements several times over the years. They are washable and really last a long time! Cleans my hardwood, tile, and vinyl floors great!!! Would recommend! I bought one of these at a garage sale years ago and immediately loved it. I ordered new shammy heads and everyone in my family wanted to "try it", then they wanted one too. These are great tools, easy and fun to use. The long cardboard box was delivered by the Post Office. The long box had be bent. When I pulled out the pole, it was bent. My husband was able to straighten it to the point where it can be used. In looking at the pkging there was nothing padding the pole -> paper or bubble wrap. You need to pad the pole with something in packaging it. I have no complaints about the mop or design; I have used them for yrs and really like them. I can no longer buy them locally; thus I ordered from you. simplygoodstuff response: Sorry to hear about this shipping damage, but happy to hear that you resolved it to satisfaction. We have made note of your suggestions, and we will be altering our packing methods to avoid this in the future. Please give us a call if you need further assistance with this order. So glad I found it again. Had one for years but coudl not find replacement mop heads. Bought this mop with extra mop head. It cleans all my tile floors clean not like other products that don't really clean well. This is my mop of choice,so glad I found it again. I inherited a mop like this after I closed a home for a client who had moved out of state. I loved that mop and used it to death... then couldn't find another one. Now I have! 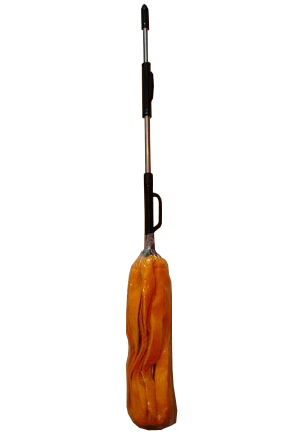 When do you think you will have the shammy mop handle in stock to ship out? I have the mop heads but need the handle desperately. Thank you. As of today, it looks like it will be 4 weeks or more before we have them. If you sign up for the waiting list, we will email once inventory arrives at our warehouse. 4 of 5 Customer(s) found this Answer helpful. I just need the refills for this mop. How do I order that? Can this be used to dry a car ? Yes it can. They work great for that. Can this mop withstand oil? Will the fibers break down? Yes it can. It will not cause damage. In most cases, if it looks like it'll fit, it will install just fine. An All Purpose Replacement Pad For Your Microfiber Mop. Use It Wet Or Dry. A Four Pack of Microfiber Cloths to Make Dish Washing Easy. Cleaning, Buffing, Dusting & More. The Fast, Easy & Safe Way.